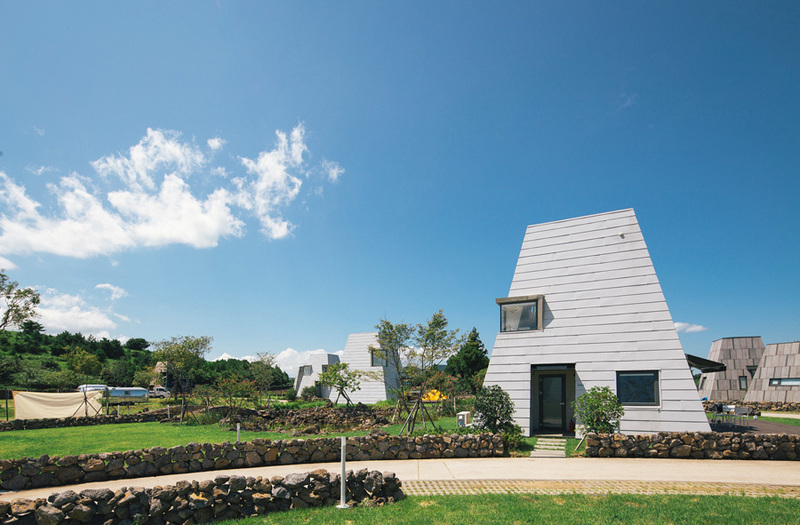 Around Follie is located on a wide ground next to Nasiri-Oreum (Oreum: the rising small defunct volcano in the Jeju, the Jeju dialect). Z_Lab leading this project saw the potential of the land and combined two concepts: outdoor and community. 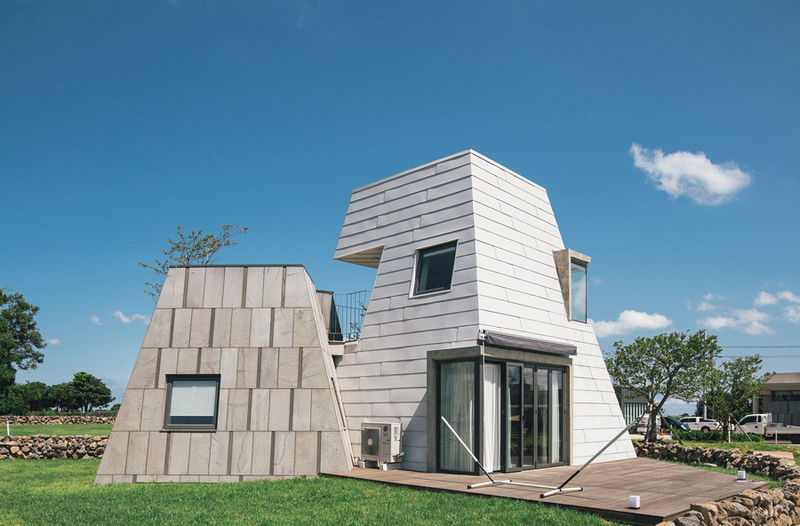 They wanted to make a place that fully renders Jeju’s nature as it is for a community that shares sensibility while spending time together, as well as a place that fully offers the essence of outdoor experience.They spread the objects around Follie in a wide land area every 20 meters, so that events and cultural programs can be flexibly interconnected and make the place livelier. 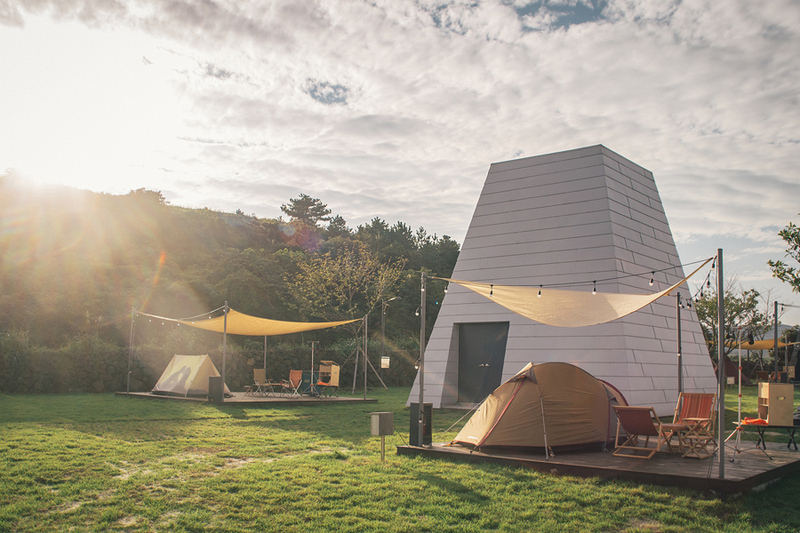 The campsite is made up of seven lodges, three Airstreams, a number of campsites, and other additional facilities. A.Ground performs many purposes: BBQ pub and café, reception, and shop. Follie Park, which has a swimming pool, is a space where you can use it as a a stage for festivals or events. 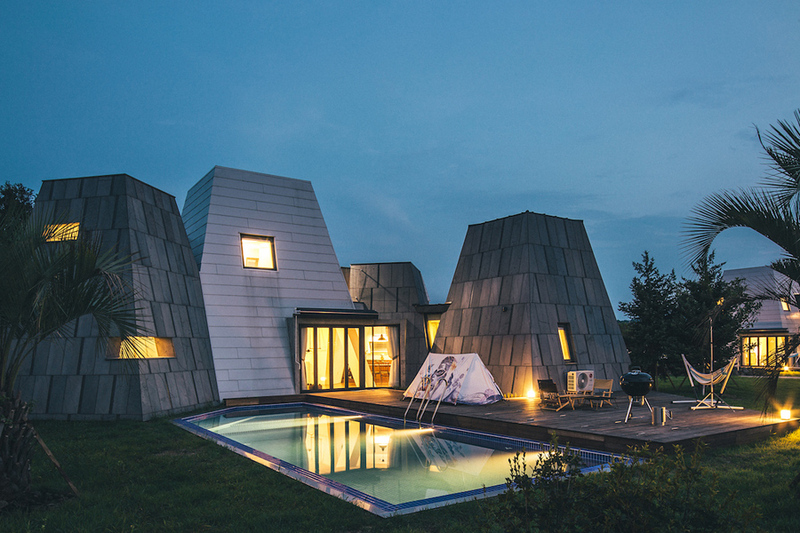 The lodge is organized into 4 types: loft, twin, suite, and Pool Villa. 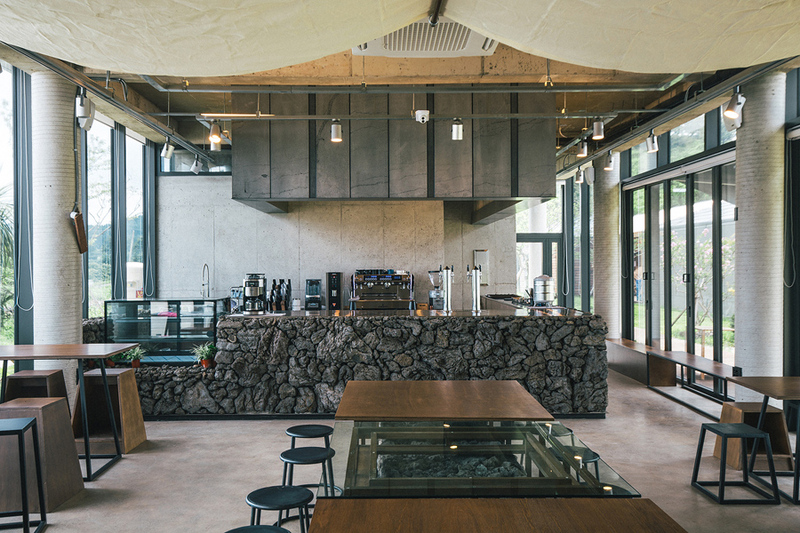 The arrangement of a stone grave in Jeju inspired the idea where the space expands from two and three to four, giving it more diversity. Unique design utilizing the natural materials and the colors that are matched with the surroundings shapes the identity of Around Follie. 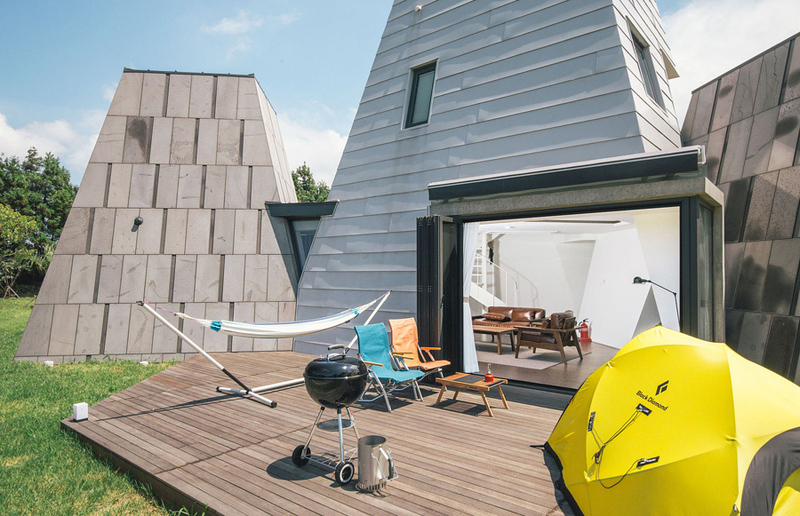 A unique design that uses the material properties and colors to match the surroundings creates the identity of Around Follie.It has enabled multi-option such as linking camping decks and caravans so that variety of activities can take place based on camping. They also wanted to attempt the “movable stay” with ideas like a Micro Bus, including the food truck Eriba Puck, etc., that they saw at camping festivals—for the feeling of free-spirited camping. They obtained 17, 27, and 31 ft. Airstreams made in the 1960s and updated them to a new version. A. Ground, the first impression of Around Follie, is a cafe, shop, restaurant, and observatory for visitors and a reception desk for guests.A horizontal design is harmonized with the surrounding landscape.It is a community place for both visitors and guests and serves as a community that encompasses the entire area.With eight tent sites, one auto home site and six deck sites (also known as huts), the camp site is a place where you can enjoy the outdoor experience that Around Follie is aiming for. 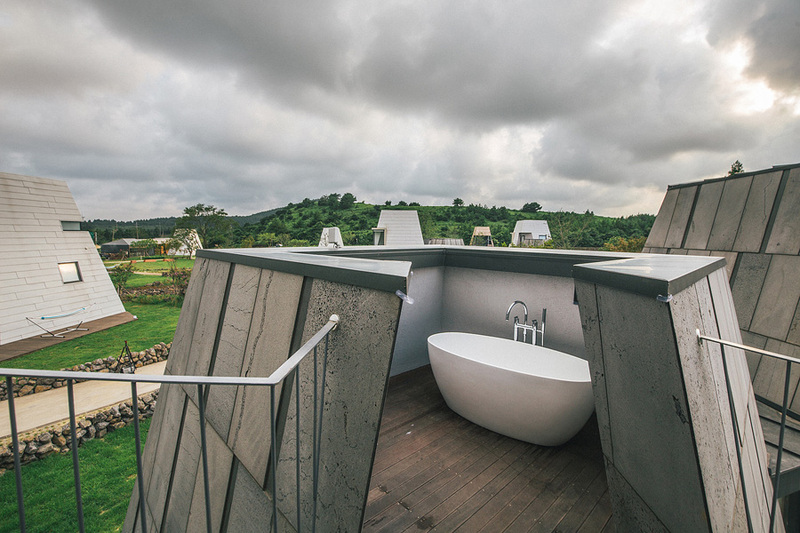 After viewing this cool glamping be sure to check eco camp in Chilie.